Today is Day 2 of the CAS-ual Fridays Stamps release and we have a very pretty wintry set to share with you today! 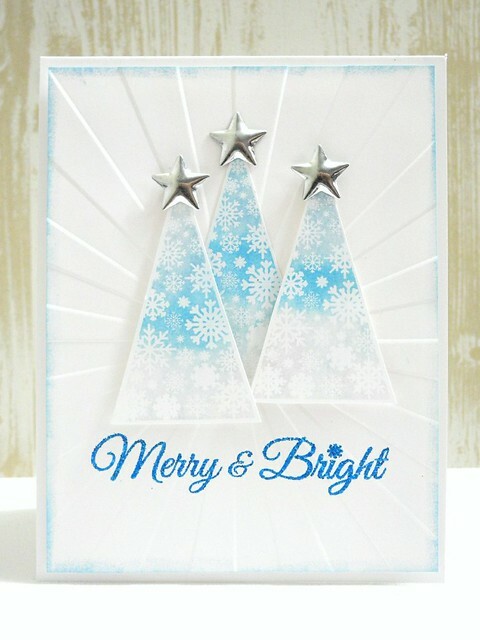 For my card, I stamped the trees in VersaMark ink and then brushed Perfect Pearls over them. This card has SO much shimmer! For reals! I love that! These trees really have so many possibilities! I added some metal stars from My Mind's Eye to the tops as a simple decoration that adds so much! You REALLY should check out what the rest of the team has done with this gorgeous stamp set! AND you could WIN this stamp set, too! Yup! Head on over to the CAS-ual Fridays Stamps Blog to check it out! Beautiful card! And I'm a big fan of Merry & Bright, you would not believe the number of M&B sentiments I have lol. But I always need more apparently. LOVE the gradation of color!!! Beautiful job, Jingle! This is GORGEOUS!!! Love those trees! Brilliant design all around! Love it, Jennifer! could not love this more! I loooove the wintery colour scheme! 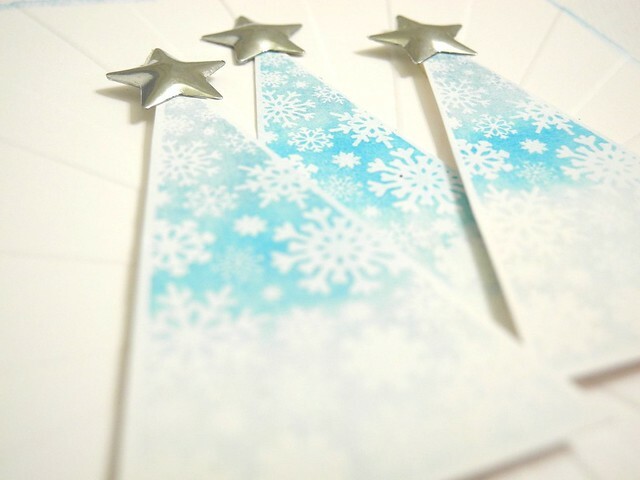 What a festive design...love your gradation of colour on the trees! I really love this card!!! Love this Jingle!!! totally inspired! Such a lovely CAS card! Love the sentiment and fun embossed background! I love these peaceful, elegant trees! Just wonderful! Thanks so much for sharing! Simple and elegant card----love, love, love it! Love that gradient in the trees :) lovely as always !